Today, the UPS guy brought my author copies for REAL REVISION: AUTHORS’ STRATEGIES TO SHARE WITH STUDENT WRITERS, so I’m celebrating with the first of what I hope will be many author interviews on the topic of real revision…the nitty gritty, make-the-book-better strategies that some of my favorite authors use when they’re revising a project. Since most of the author interviews in the book are with middle grade writers, I wanted to feature some authors of my favorite YA novels in this series. 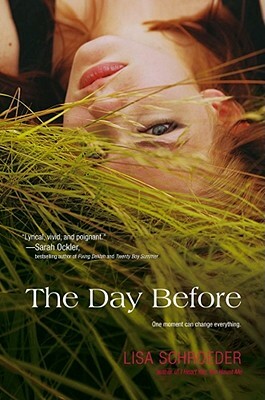 THE DAY BEFORE by Lisa Schroeder is the story of a precious 24 hours, in which a girl whose life is about to change the next day crosses paths with a boy with a secret deadline of his own. I requested this book through Simon & Schuster’s e-galley program for two reasons. First, I’m a fan of Lisa’s beautiful, poetic writing myself and second, because I have a contingent of seventh grade girls in my classes who devour everything she writes. I read this book in a night (be warned…it’s tough to stop once you get going!) and loved it for its romance, its mystery, its magic, and its moments…those moments that we sometimes don’t stop to appreciate until something makes us. The poems here sparkle like a collection of favorite seashells at the beach, and I can already tell I’m going to have to referee fights over this one when I pick up a copy for my classroom library. How do you tackle the revision process? A little at a time as you write? Or all at once after you’ve finished a draft? I am one of those writers who revises as she goes. That is, I’ll read through previous pages, edit them as necessary, immerse myself in the story and then continue on writing new pages (hopefully!) So by the time I get to the end of my draft, it’s usually in pretty good shape. I set it aside for a while, and it’s amazing what happens then. My brain will come up with things that need to be changed – fleshing out a character more, working on something to make it more believable, etc. So I make a list and after some time has passed, I pull it out and tackle those items that need work. After that, I find a reader or two, and I then revise based on their comments. One thing I do is go through the manuscript a couple different times, after I feel good about plot and characters, and do a read-through focusing on one certain thing. For example, I’m not particularly good at adding in smells/sounds naturally. So I’ll do a read through and specifically look for areas where I can add more sensory details. To do a really thorough job with this, I’ll print out the manuscript and use different colored highlighters – pink for sights, green for smells, yellow for sounds. It gives me a visual of those items and shows me where I’ve done a good job and places where I should add more. Another tip is I like to print out the manuscript so it reads like a book, and read it out loud. To do this, go to your manuscript in Word, go to Format, then Columns and click on Two. Then go to Format, Paragraph, and change your spacing to one. Finally, go to File, Page Setup and change the orientation to Landscape. Not only does the manuscript now look more like a book, which I find makes my eye read the thing in a different light, but it also saves on paper when printing it out. I am a lean writer, so I rarely have to cut things, unless I decide to get rid of a sub-plot and add in a different one or something. Pacing is one of those things that I just feel as I write. Every scene I try to ask myself – is this scene advancing the plot and if not, it better have a really good reason for being there, like showing something important about the characters. I don’t usually have to revise for pacing much, which is good because I’m guessing revising to work on pacing issues can be a big job. I think part of that is just learning, as I do this more and more, that it’s not necessary to show every move your character makes. You can jump from morning to evening if nothing happens during the day worth talking about. I think newer writers might struggle with transitions, and that’s where all the extra stuff comes from that should just be cut. What strategies do you use when you’re revising to make characters feel real & believable? Characters are hard for me! I am always looking for new ways to make characters real and interesting and all the other things they should be. I try to give them something they love, something they hate, a place special to them, and think of how I can make their voice a bit unique. I look forward to reading your book and learning more about revising characters!! Well, this book didn’t have any big picture revisions, which was nice. THE DAY BEFORE is written in verse, so I worked really hard, on every page, making sure each word in every poem did what I wanted to do. Sometimes I agonized for hours on one poem, trying to get it just right. My editor pointed out places to dig deeper, to think about word choice, and she suggested places where I could add some depth to my characters. It was a very detailed revision, more than a big picture revision, and I think those can be just as challenging in their own way. Did this book keep its original title, or did it change along the way? Where did the title come from? Anything else you’d like to share about revising this book? Just that I hope the efforts to make every page sparkle and shine shows. Thanks for having me here to share, Kate. If you’d like to read THE DAY BEFORE (and it’s wonderful, so you really should) you can click here to find it at your favorite indie bookseller. If you’d like to read more author revision stories, I hope you’ll check out REAL REVISION. There’s a limited-time preview up on the Stenhouse Publishers site now, and you can order the book from your favorite indie bookseller, direct from Stenhouse, or elsewhere online. Love the one about printing like a book. Thanks for sharing! Thanks for the insight into your revision process! Off to order your books, Lisa and Kate. Hoping to start a teen writing club-your book and Spilling Ink are two I will be sure to have on hand for kids. Revising earlier comment- I’ll get your book when it’s out, Kate! I really enjoy hearing about the processes that other writers follow. Thank you Kate and Lisa, and congratulations to both of you on your book releases! I recently attended Stephen Roxburgh’s workshop on revising a novel through the Highlights Foundation. He gave us a couple of invaluable tips. 1. Construct a timeline for your novel, especially if the novel takes place over a long period of time. 2. For the final polish, divide the novel into twenty page chunks and shuffle. Do not revise in order. Stop as soon as your attention starts to fade or you’ll get sloppy. I use tip #1 regularly but find #2 to be really unique – may have to try that some time! Thanks, Shannon!